I have always wanted a wooden desk with drawer to keep mail in and also to decorate with. Every time I decorate the bureau, the kitties knock it all over, so I wanted something large and heavy. 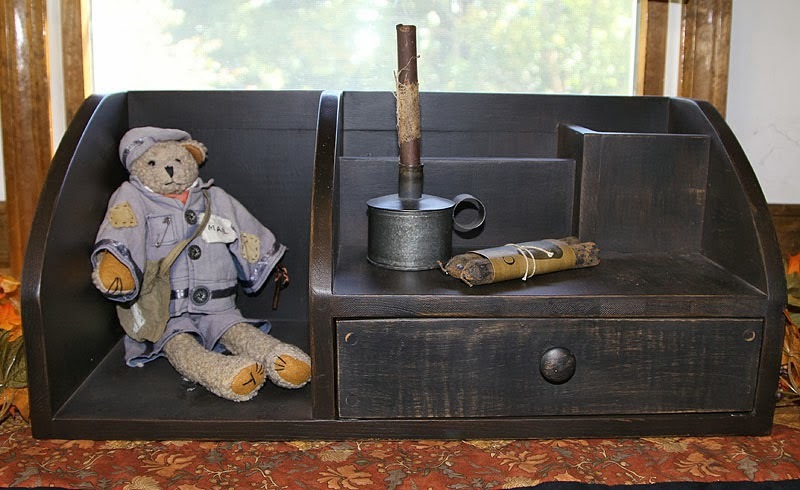 It is decorative and practical and exactly what I wanted and my wonderful friend Carol and her husband, made me one. The first coat was a light gold, then black over that, then I sanded it down in areas to show the lighter paint. I used a brown antique stain which gives it a nice aged look. I still have to decorate this area. Another thing I did was to clean my shoe rack, it does get dusty and half the shoes were on the floor. I have had these slippers since the 80's and I thought it was time to let them go, lol. 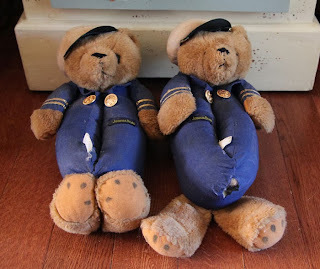 I have no idea if they are collectible and one came apart at the feet which I could fix. The bear is Captain Joshua Bear, and Bill got me them, one Christmas. They are cute, but totally impractical, not something you can walk in too well. 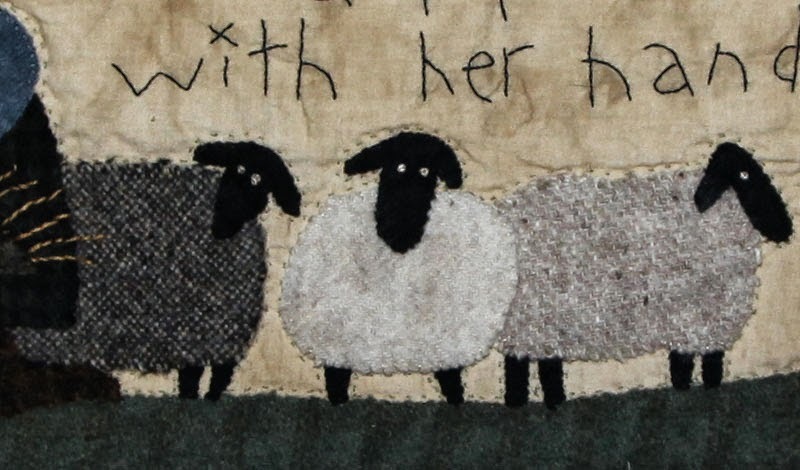 This week I have been doing a lot of stitching. I wanted to make a runner for my dining bureau, so I used similar materials on this pieces, as the one on my dining table. 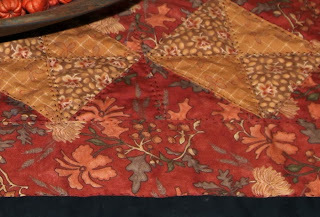 I did the half square triangles with the first method on Jennifer's Blog. It is an easy way to make more blocks quickly but I still had to cut and press and then sew them all back together. I even made them larger and cut them down, but still didn't match up my blocks, I am a lost cause, lol. I hand stitched it with black pearl cotton #5. It took me most of the week to do that and tonight I decided not to stitch on the border and just finish it, as is. It is slightly larger than I wanted, but I know it will shrink, once I wash it. I am also working on finishing my mail box, which will go on top, so hopefully I can finish that, this weekend. I added some things for the photo, love how the orange shades look with the dark woods and white walls. The runner is 56" x 20". 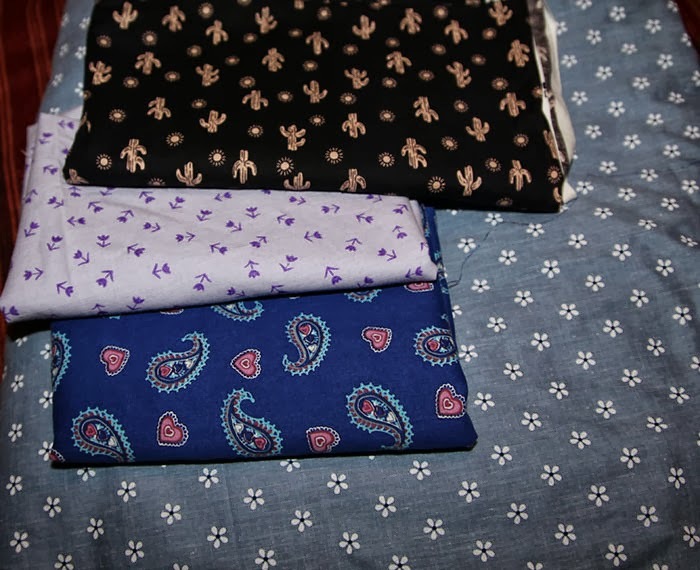 Of course my shaky hands and flash, ruin the colors, so here is a close up, showing the fabrics I used. I wanted to do a big stitch, but I keep making tiny stitches. I think I should do machine quilting on my next runners. My Sister in Law used to craft and as she cleans, she finds things and gives them to me. This time it was books and fabric. Most of the books are old patterns and magazines that aren't my type or ones I can reuse into new things, so those will go to the salvation. I am not sure on the fabric. The blue with flowers is a bit stiff, reminds me of curtain or pillow fabric, so wondering if it would be a good backing for quilts, for my daughter. I had to wash it, since it smelled like musty moth balls. There is at least 5 yards or more of the light blue floral. She also had this panel with some fun prints. I hated to wash it, but the smell was horrid. It might be fun to make something out of it. I am still using my big bag of apples. I made apple cookies and apple crisp. Today I made apple burgers and apple butter. 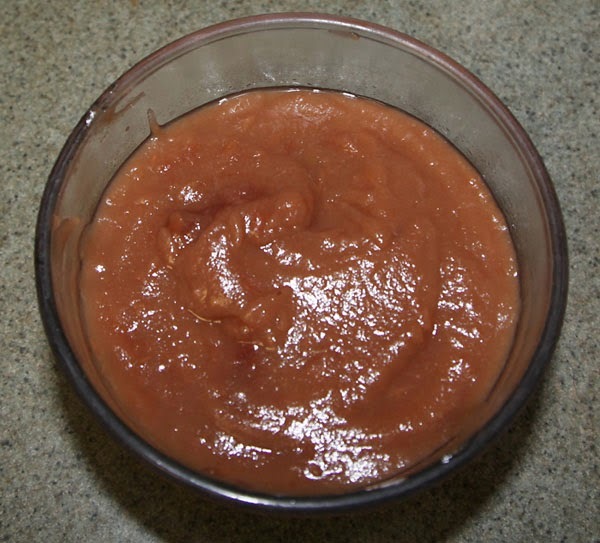 It was the first time I have made it and I used all of the apple so the natural pectin thickened it nicely and it tastes good, even without sugar. It will be nice to use on rice cakes. I am still looking for the original recipe for apple burgers. I sauté onions and grated apples in butter, then add that to the hamburger and bread crumbs, then you make small patties and back them in the oven, my family loves them. For the apple butter, I cooked the apples for about 4 hours, than cooled it down, put it in the blender and then cooked it for another two hours. We had a beautiful weekend and perfect weather for walking. It is the perfect time of year for walks along the cliffs, the sun is shining and the cool ocean breezes are so refreshing. 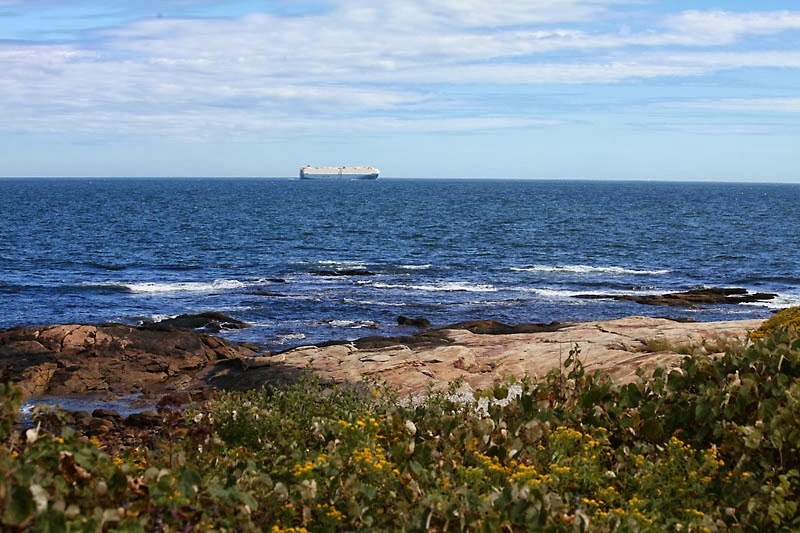 This area is especially nice since you can walk along a trail or explore around the rocks and the tidal pools. 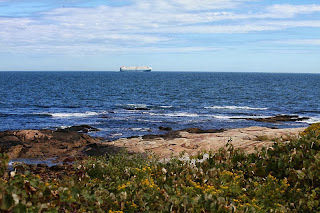 A container ship was heading for the open waters. 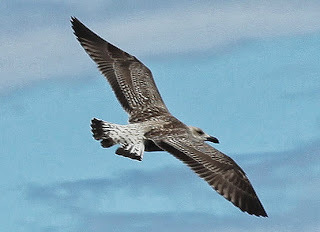 The gulls were gliding with the winds. Another path follows the cliffs and veers off into the woods. 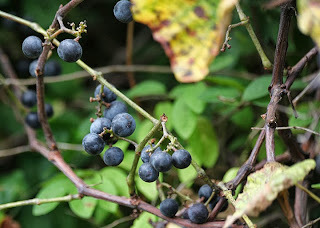 Fall is grape season and even though I can't eat them, the smell was heavenly. Beautiful flowers line the path on both sides. 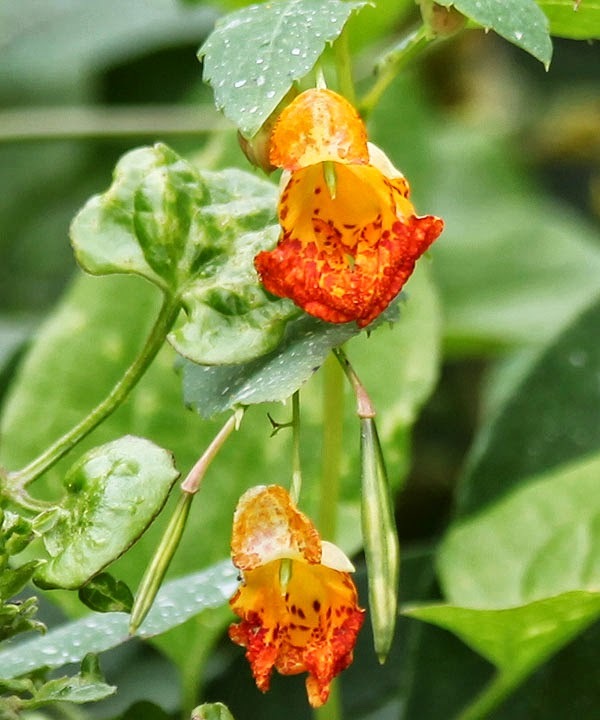 And some strange plants, as well. 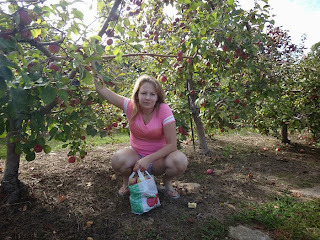 It was still early when we got home, so what better way to end the day, then apple picking. We went home first and grabbed Danielle, she picked a smaller bag for her brother and his wife and I got a bag that I am wondering, how I will eat them all, lol. Yesterday was another great day for a ride and a walk. 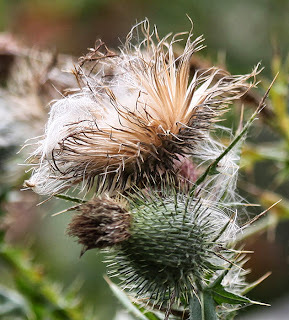 We walked along the salt marshes but the bugs were so bad, we walked really fast and I didn't take photos. On the way home I saw a sign that we go by, every time we are there. It says, The Fantastic Umbrella Factory. I thought it was a shop and decided we should go check it out. Well, it was much more than a shop. It was a group of buildings that are interconnected by paths and trellised arches. It was well worth the visit and we got some more walking in. Most of the items were made by local artisans, but not my cup of tea. 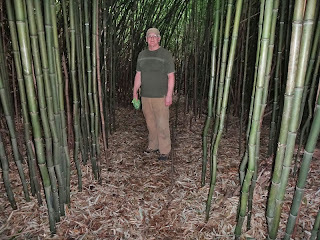 This was a fun part of the walk, a bamboo forest. 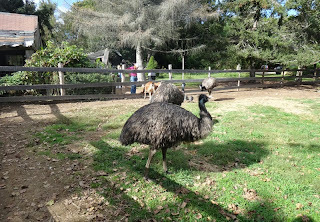 I am not sure if it had an out, we couldn't find it, so came back the way we started. 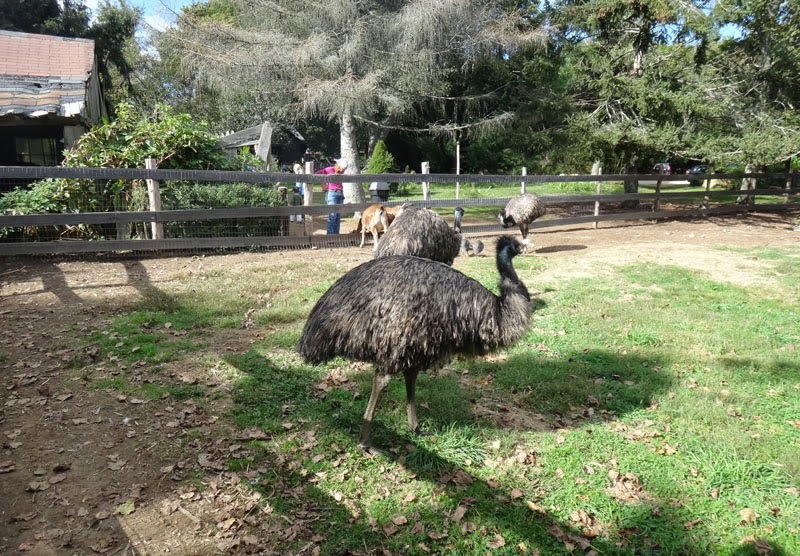 It also had a garden center, ducks and other fowl walking around and even some goats and ostriches. 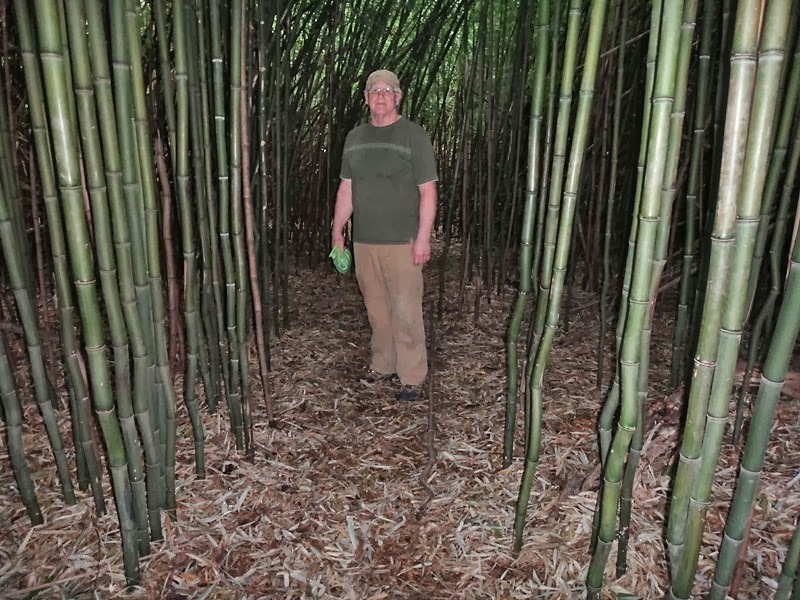 It is amazing what you find in your own backyard, so it is well worth exploring places in your own neighborhood. I hope everyone had a wonderful weekend. I finished another piece, A Gentle Life by Threads That Bind. I love this pattern and it was fun to do. I used tea stained muslin and wool with a simple stitch so it worked up fast. The original is in a frame and I didn't have one that size, so I added a border, so I can hang it on the wall. I also did some quilting around the applique and edges. The problem is, I had to wash off the marker and added a little more walnut stain so it warped a bit in the dryer. I will have to do a steam press to straighten it, before I can put it on the wall. I used a stiff black fabric for the border, which I think as too thick for this piece. Here is a close up of some of the sheep, I used different whites and textures for the sheep. Some is off the bolt and some is from old men's jackets. I wanted to make something to put on my small window in the dining room. That room has glass french doors so I don't use curtains and having one on the little window would throw it off. So, I decided it was a good place to decorate with a quilt for the seasons. I use little clip ons that hang on the rod and clip to the quilt, so it is a perfect way to hang a quilt and easy to change them out. 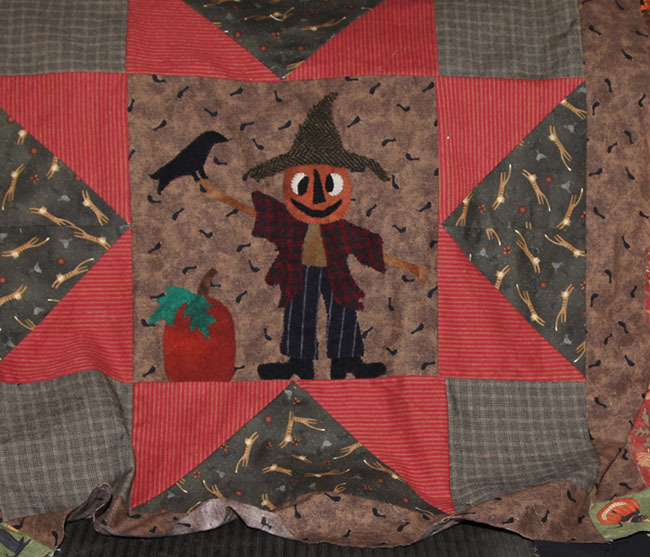 The quilt is from a design by Jan Patek called, Sunflowers and Scarecrows. 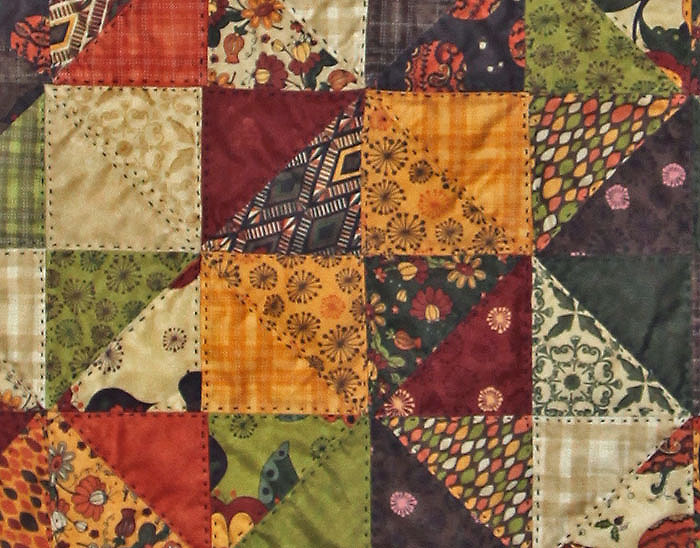 It was in the fall issue of Primitive Quilts and Projects and I finally got a chance to make it. I love the layout and sunflowers, but I wanted to use my scarecrow which is in my fall booklet. I got a bit carried away with the fabric choices, but I wanted it to be fun. I did a prim stitch around the designs and the blocks with black pearl cotton. I also won a giveaway from Sauder's Fabrics and received a wonderful book on making mini amish quilts and they even gave me an extra surprise pattern. They are so generous in their giveaways and have several of them running right now, so be sure and visit. 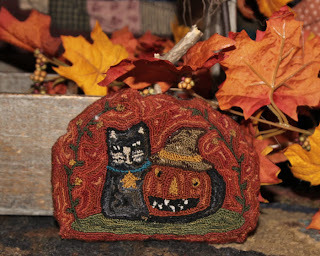 Last week I started a punch needle piece for fall and today I finished it. I had to work two days straight, but I got it done. I also got all of the applique done on my wall quilt, now I can quilt it and finish it. The pumpkin is a pattern by Brenda Gervais called Boo and Jack. It was a lot of punching, the finished size is 7" long and I am a tight puncher. I used DMC for the main colors and valdani for the kitty. I love their black shades. To get the multiple colors, I just grab similar colors and punch in random patterns around the pumpkin. I have a collection of tree branches that I save for projects like this, so I used that instead of a pumpkin top. I hope you enjoy my newest piece and everyone has a wonderful weekend. We had a beautiful weekend but as luck would have it, Bill and I seem to have gotten a flu bug so we sat on our butts and watched tv all weekend. The good thing was, I was able to stitch all day and I got the quilting done on my table runner and then today I finished the sunflowers and binding. 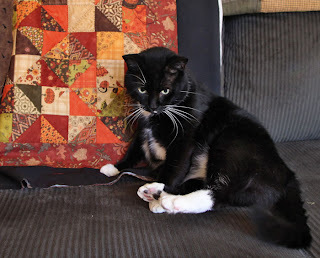 The bad thing is, my brain is messed up and I cut from the wrong point of the quilt and lost my black border and it had to be double folded to make a binding instead. All in all it came out ok and looks nice on the table. The fabrics were from a charm pack called Posh Pumpkins by Sandy Gervais and the leaves are from one of her older fabric lines. 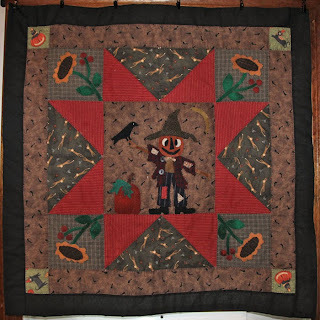 I used the same sunflowers that are in my scarecrow hanging since he will go on the window in this room and now they will match. The fabric was a prize from Sauder's Fabrics and if you visit now you can enter their contest for their 40th anniversary. I started two new projects this week. 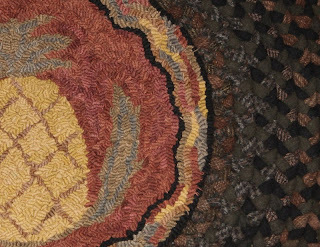 One is a table runner for fall. 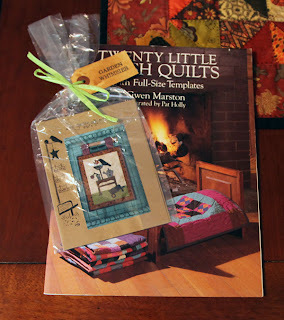 I won a charm pack of Posh Pumpkins from This n That fabrics, which is now, Sauder's Fabrics. They are also doing another contest and giveaways this month to celebrate their anniversary, so be sure and visit. It has a lot of fun prints with fall colors so I went with half Square triangles and then played with them to get a layout that I liked. It is funny how one design can look different ways when it all goes together. I used a fall leaf fabric for the border, than black for the binding, I think it gives it a nice touch and contrast to the oranges. Of course, the minute I laid it on the couch to take a break, Moki jumped on it. He never sleeps on the couch, but if i have a quilt or rug item on it, he is there. I am hand quilting with black pearl cotton, so hopefully I can get that done this weekend. 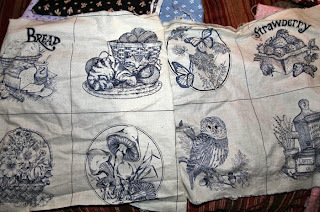 I will also add a little applique to each corner, I am thinking a simple wool sunflower. Another project is a fall wall hanging. 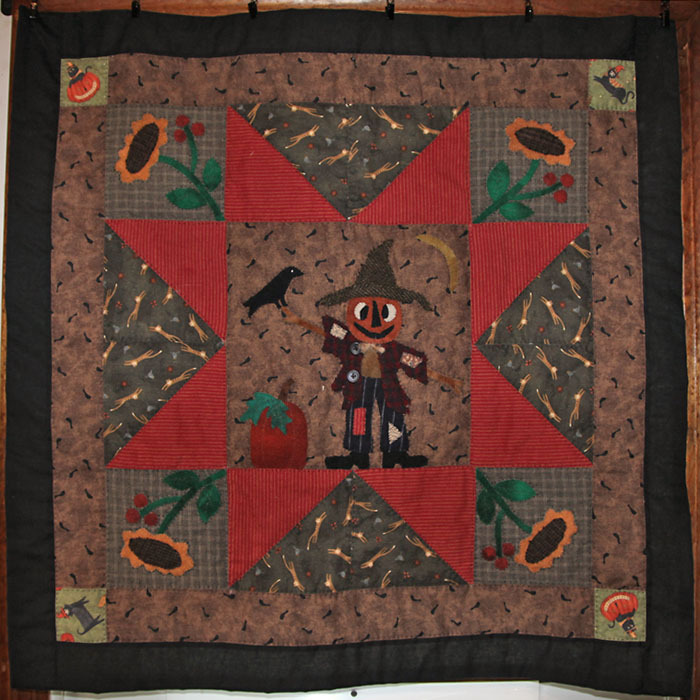 The original pattern is Sunflowers and Scarecrows by Jan Patek. It is in the Fall 2011 issue of Primitive Quilts and Projects and she also has the pattern on her website. I decided to change the middle section and put my scarecrow in the middle. He is found in my Ebooklet, Fall is in the air. I will add details after I add all the appliqués. I also wanted to share a prize that I won from Whimsical Workshop. I love Heidi's designs and when I saw Under the Sea, I loved it. 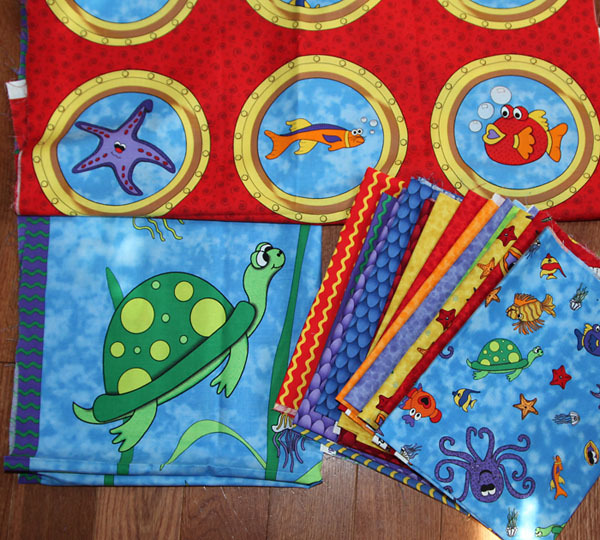 Of course I will make my sweet grandson a quilt with it, but there is enough to make more, so I think a few charity quilts would be fun too. I was amazed at how much fabric I got and how beautiful it looks in person. I finished my rug this weekend, at least as far as I wanted to go on it. 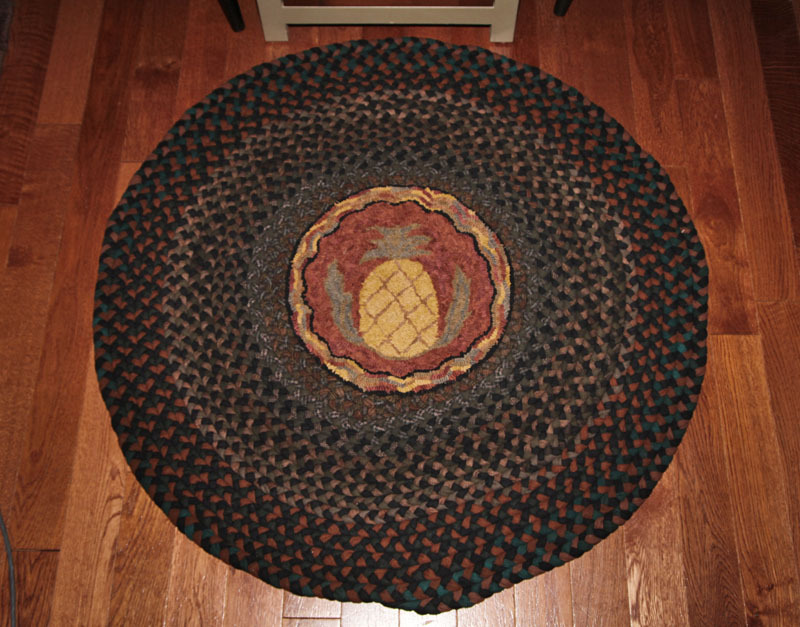 It was done with thrift wools and smaller braids so I just wanted to use what I had and make a smaller rug with it. 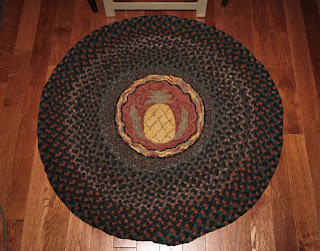 The braided rug was done years ago, so it is a bit worn, but with the scrappy wools, it all goes together. We have had rain for days so I wasn't able to get an outside photo. There are so many shades in the wools it is hard to get the camera to recognize all of them and get true colors, but I got pretty close. The finished size is 39" round. Too small for some areas and too big for others, so I put it in front of a table, for now. The center going from light to darker the way it did, offset the look of the circle and I am not great at ending my braids, still working on that technique. 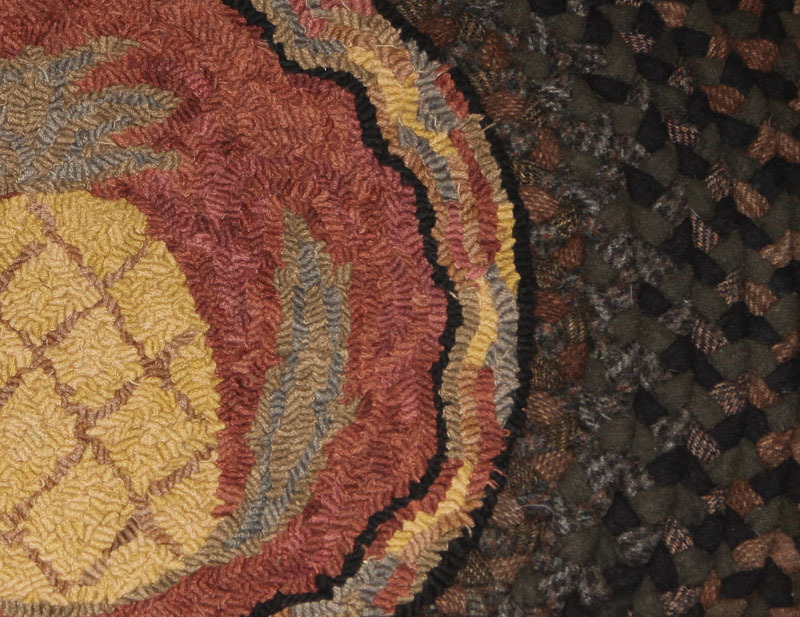 Here is a closer look so you can see the colors and textures I used in the rug. Men's jackets make great braided rugs and hold up well.